Find Vanity 1-800 Numbers Available for Instant Purchase! Finding 1-800 numbers available is a challenge because the 800 prefix has been around since 1967. However, you can still find 1-800 numbers available for purchase as well as other toll free prefixes such as 888, 877, 866, 855 and the newest toll free prefix 844. A toll free number is a way in which a business can allow their customers to call the company for free in order to make purchase requisitions, ask doubts and offer feedback. Instead of the caller being charged for the call, the party that is being called will get charged for the service. This way the business will be able to attract more people to call them as the customer will not have to worry about being charged. 1. 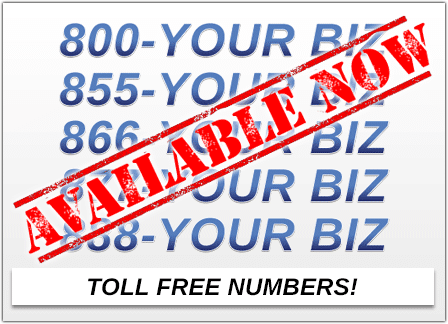 Vanity 1-800 numbers give your small business instant credibly. 2. You can find 1-800 numbers that reinforce your brand. 3. When customers lookup 1-800 numbers they’ll remember easier if it spells a word.